Seeking the initial moment described by Debord, Push Play explores the work of artists who borrow from play and games to expose social, cultural, and philosophical issues. From playground antics to mathematical strategy, the artists in Push Play mine the significance of games, reinventing them to create experiences that involve the viewer and reflect on the nature of participation in art and art exhibitions. Strategies tied to game playing have historically attracted the avant-garde, most famously the chess master Marcel Duchamp. His every artistic move had his chess partner in mind: you, the viewer. Games were also intrinsic to the work of war-addled Surrealists and Dadaists, the inventors of the exquisite corpse and automatic drawing, in their quest to upend the bourgeois pretensions of art and free the artistic imagination. 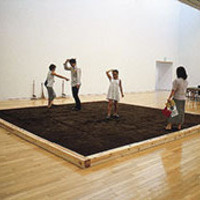 In the 1960s and 1970s, the countercultural and anti-war Fluxus group and the New Games Foundation questioned capitalism and corporate culture by staging massive non-competitive games in city parks. Moving away from the classical chess period of kings, queens, and bishops, the works in this exhibition do not represent medieval warfare but strategies of decision-making around contemporary culture and politics. Among the arcade of objects in the show is a version of Guitar Hero by Cory Arcangel, hopscotch by Mary Flanagan, and Ryan Gander’s double blackjack - while the more mystically inclined may gravitate toward Allan McCollum and Matt Mullican’s divining game. Other artists include Patrick Bernier and Olive Martin, Ruth Catlow, Futurefarmers, Jeanne van Heeswijk and Rolf Engelen, Paul Noble, Pedro Reyes, Jason Rohrer, David Shrigley, Erik Svedäng, and Yoko Ono. You are invited to come in and play. Push Play is curated by Melissa E. Feldman and organized and produced by Independent Curators International (ICI), New York. Push Play was made possible, in part, by grants from the Elizabeth Firestone Graham Foundation and the Robert Sterling Clark Foundation, and with the generous support from ICI’s International Forum and Board of Trustees. Opening reception: Thursday, September 29, 6-8 p.m.